A promise or act on part of offeree indicating a willingness to be bound by terms and conditions contained in an offer. 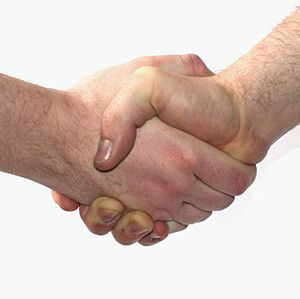 A handshake is often used to mean there is an agreement. When people feel or think the same way about something, they agree. Sometimes it is important to write down or make a promise to what has been agreed on. This is called an agreement. Agreements are common in law and business. For example, when a person takes out a loan or hires someone to work, an agreement is usually signed so everyone understands what must be done and in what time it must be done. Agreement Facts for Kids. Kiddle Encyclopedia.